Grace Cossington Smith visited the site of the Sydney Harbour Bridge many times during its construction, and produced some of the most memorable images of the project in a large number of sketchbook drawings. Her coloured pencil renditions of various aspects of the building express something of the bridge's architectural energy and its central symbolism as a marker of the modern age. This view of the bridge from the North Shore shares many of the elements of her oil painting of 1928-29 'The curve of the bridge', in the Gallery's collection. Signed l.l., black pencil "G. Cossington Smith". Not dated. 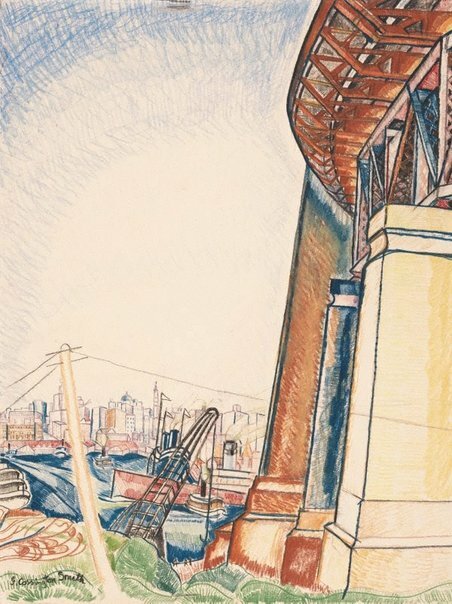 Deborah Hart, Grace Cossington Smith , 'The curve of the bridge', pg. 130-133, Canberra, 2005, 132 (colour illus. ), 176. Denise Mimmocchi, Sydney moderns: art for a new world , 'Icon of modernity: the Sydney Harbour Bridge', pg. 154-163, Sydney, 2013, 158 (colour illus. ), 315, 324. Daniel Thomas, Art Gallery of New South Wales Quarterly , 'Grace Cossington Smith', pg. 510-521, Sydney, Jan 1970, 517 (illus. ), 521. Quarantined Culture: Aust Reactions to Modernism , Sydney, 1995, 85, 197, 210, 211, 246.